1 In small bowl, combine Hellmann's® Real Mayonnaise with vinegar, oregano, garlic and basil. Reserve half of mixture and set aside for salad. 2 Grill or broil chicken, turning once and brushing frequently with remaining mayonnaise mixture, 12 minutes or until chicken is thoroughly cooked. 3 Toss salad greens, tomatoes, parmesan and croutons with reserved mayonnaise mixture; seasoning to taste with salt and pepper if desired. 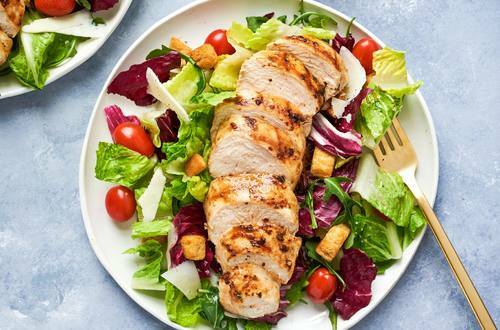 Slice chicken and serve over salad greens.